TIAHRT, Todd, a Representative from Kansas; born in Vermillion, Clay County, S.Dak., June 15, 1951; attended South Dakota School of Mines and Technology, Rapid City, S.Dak. ; B.A., Evangel College, Springfield, Mo., 1975; M.B.A., Southwest Missouri State, Springfield, Mo., 1989; teacher, Kansas Newman College and Evangel College, Wichita, Kans. 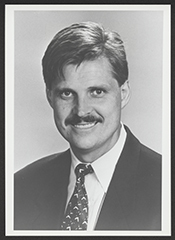 ; proposal manager, Boeing Company; unsuccessful candidate for election for the Kansas state house of representatives in 1990; member of the Kansas state senate, 1993-1995; elected as a Republican to the One Hundred Fourth and to the seven succeeding Congresses (January 3, 1995-January 3, 2011); was not a candidate for reelection to the One Hundred Eleventh Congressin 2010, but was an unsuccessful candidate for nomination to the United States Senate; was an unsuccessful candidate for nomination to the United States House of Representatives in 2014.